Aton announces the completion of the Phase 1 RC drilling programme at Rodruin | Aton Resources Inc.
Vancouver, December 5, 2018: Aton Resources Inc. (AAN: TSX-V) (“Aton” or the “Company”) is pleased to announce the completion of the Phase 1 reverse circulation percussion (“RC”) drilling programme at its advanced Rodruin prospect, within the Company’s 100% owned Abu Marawat Concession (“Abu Marawat” or the “Concession”), located in the Eastern Desert of Egypt. The Phase 1 drilling programme has successfully tested all the main mapped areas of surface mineralisation on the South Ridge at Rodruin, including the Aladdin’s Hill, Spiral Pit, Central Buttress, and the GF zones (see Figure 1), with mineralisation having been identified in holes from all of the drilled areas. The Phase1 RC drilling programme at Rodruin was completed on December 3, 2018, with the final hole ROP-050 being drilled to a depth of 200m (see Figure 1). The programme was designed to preliminarily test the overall prospectivity of the South Ridge at Rodruin, and this objective was successfully achieved with holes targeting the main zones of mapped surface mineralisation at Aladdin’s Hill, as well as the Central Buttress (“CBZ”), Spiral Pit (“SPZ”), and GF (“GFZ”) zones (see Figure 2). Logging of the drill holes continues to be encouraging with mineralisation having been intersected in almost all holes drilled to date. Good widths of gossanous carbonate hosted mineralisation have been intersected, from surface or very near surface, at the CBZ, the SPZ and the GFZ. Further sulphide–hosted base metal mineralisation has also been identified in logging from northeast of Aladdin’s Hill, following up on the intersection of 163m @ 0.90 g/t Au returned from surface in hole ROP-017 (see news release, dated November 12, 2018). The Company intends to update further assay results from the Phase 1 drilling programme very shortly, while the final assay results from the programme are not expected from the laboratory until the New Year. 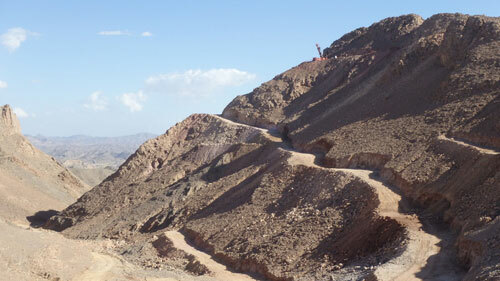 The main Hamama exploration camp will be shut down for a short break over Christmas and New Year, however access road construction at Rodruin will continue ahead of the next phase of drilling, which is planned to commence in early 2019, following the compilation, review and interpretation of results from the Phase 1 programme. The Rodruin prospect was discovered in December 2017 by Aton geologists (see news release dated December 14, 2017), and is located approximately 18km east of the Company’s Hamama West mineral deposit. 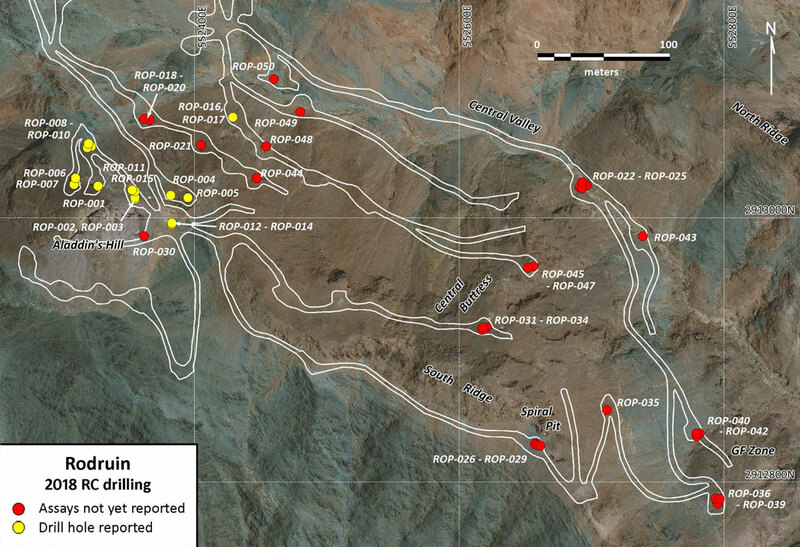 Field mapping and sampling has indicated the presence of ancient mine workings and extensive gold mineralisation over an area of at least 700m x 400m at surface. Mineralisation is associated with a sequence of carbonate and metasedimentary slate and greywacke rock types. Abundant visible gold has been identified in hand specimens from surface outcrops, and ancient dumps and underground workings, with individual selective grab samples assaying up to 321 g/t Au. The main series of ancient underground workings in the Aladdin’s Hill area has been sampled to approximately 40m below ground level, indicating continuation of the surface mineralisation at depth (see news releases dated February 6, 2018, March 5, 2018 and April 16, 2018), and drilling has now confirmed the presence of high grade gold mineralisation with individual samples returning assays of up to 221 g/t Au over metre intervals (see news release dated October 1, 2018). Drilling results released to date from Rodruin include intersections of 36m @ 12.47 g/t Au from 5m (hole ROP-003, see news release dated October 1, 2018), and 163m @ 0.90 g/t Au from surface (hole ROP-017, see news release dated November 12, 2018). The technical information contained in this News Release was prepared by Javier Orduña BSc (hons), MSc, MCSM, DIC, MAIG, SEG(M), FGS, Exploration Manager of Aton Resources Inc. Mr. Orduña is a qualified person (QP) under National Instrument 43-101 Standards of Disclosure for Mineral Projects.